If you’re in the travel business and you watch as much television as I do, you’ve probably guessed I’m talking about cruise line TV commercials. The above taglines are from commercials aired by Norwegian Cruise Line, Princess Cruises, Viking River Cruises, Carnival Cruise Lines and Carnival Cruise Lines, Royal Caribbean International, Celebrity Cruises and MSC Cruises, respectively. Have I missed anyone? This year, cruise line advertising on TV seems to have reached unprecedented levels. I don’t recall an onslaught like this ever, at least in my 20 years of covering the cruise industry. So I asked Rick Sasso, president and CEO of MSC Cruises USA and a cruise line executive of four decades, for his perspective. Jim Berra, the mastermind behind Carnival’s current ad campaign, agrees that the avalanche of catchy, visually appealing commercials is not business as usual. “I’ve not seen this many cruise brands utilizing TV advertising in the six years I’ve been here,” said Berra, chief marketing officer for Carnival and chairman of CLIA’s marketing committee. Carnival got the ball rolling in September with an unusual $25 million end-of-year “Moments That Matter” campaign that included TV, radio, digital and direct mail. At the time, Berra said it was “more than double what we typically spend this time of year, so we definitely are making a much more aggressive investment, especially in TV.” The campaign has continued through this Wave Season. So what prompted this return to the small screen? 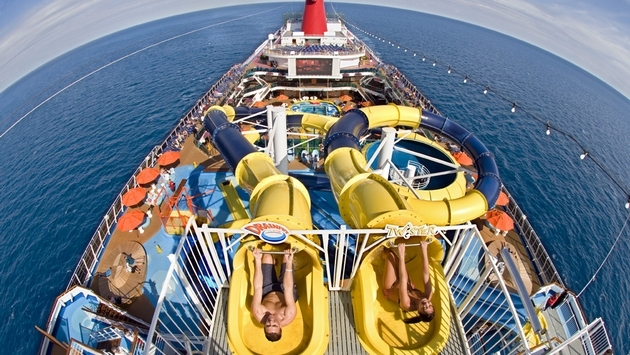 Carnival was trying to recover from a year of negative publicity primarily surrounding the Carnival Triumph incident in February 2012, which dampened demand. Sasso notes that cruise capacity has jumped 13 percent in the Caribbean this winter with new ships based there, including his own MSC Divina as well as the Norwegian Getaway and the Royal Princess. “It means we have to drive 13 percent more volume,” he said. I live in the Chicago area, which has endured the worst winter in memory, so perhaps I’m seeing more cruise commercials because it’s a key market this quarter. And Carnival was the national cruise line advertiser for NBC’s telecast of the Sochi 2014 Olympic Winter Games, and even created a cute commercial showing four boys pretending to be Olympic bobsledders as they glide down the water slide on a Carnival ship. On the river side, I see Viking River Cruises commercials all the time, on popular cable shows and major network programming, and they didn’t just start with the winter. The TV campaigns appear to be working, at least for Carnival, which reported a record number of reservations taken in one month when more than 565,000 guests booked between Jan. 1 and Jan. 31—that’s a 17 percent increase than the same period the prior year, which was before the Carnival Triumph incident.